Live in the heart of Steveston village! 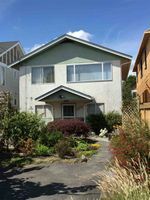 This is a fantastic location, just one street away from Steveston shops, restaurants, Lord Byng school, Steveston park, Gary point park, South and West Dyke, and restaurants. Located on a quiet street away from buses and main traffic, you can build your 2178 sq ft dream home with a 2car garage from the back lane.